FRONT ROYAL, Va. (CNS) — As many parents know, all kids come into the world ready to draw, but as the years pass, each child reaches a point where they make a choice — to draw or not to draw. 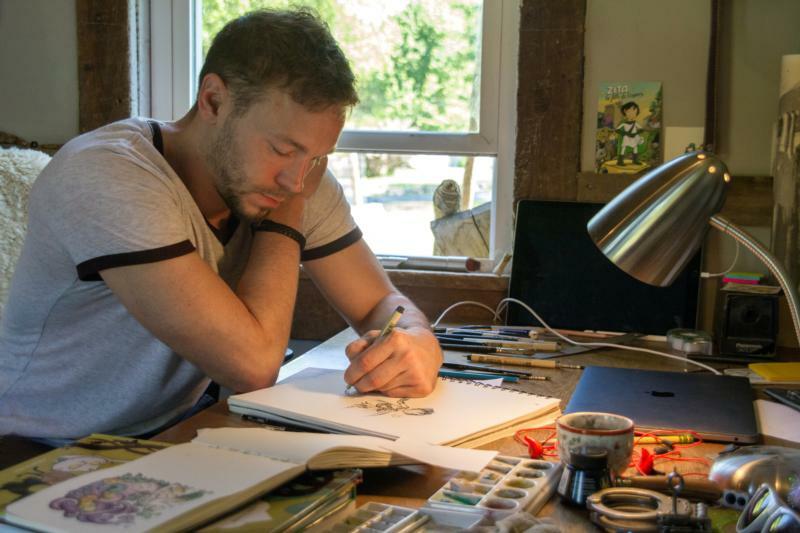 It was never a question for comic artist and arrow enthusiast Ben Hatke, who doodled his way through many a grade school and high school class, filling the margins with grand adventures. His dad was an architect at Purdue University in Indiana and his mom took him and his two sisters to the library regularly. When the young boy discovered newspaper comics such as Calvin and Hobbes, it was love at first sight. Now, many pounds of pencil lead and paper later, the Christendom College grad and father of five has made a career out of “drawing in class.” For nearly two decades, he has illustrated comics, Seton Home Study School textbooks, children’s books and graphic novels. The rights to his first graphic novel, “Zita the Spacegirl,” was picked up recently by Fox for a movie and there is hope that one day Hatke’s brave characters will make it to the big screen. “Zita the Spacegirl” chronicles the adventures of young Zita as she braves the unknown in pursuit of her friend who vanished after pushing a mysterious red button. The story, and subsequent trilogy, became a hit with readers who have become big fans of Hatke’s work. What many of the fans don’t know, however, is that Zita was not Hatke’s idea. “I feel like I’m always coming clean when I tell this story,” said Hatke, as he sat next to his desk, covered with pens, paper, tiny action figures and a Madonna and Child statue. The admirer from Indiana gave Zita a new outfit and added a green cape. He then presented his crush with a whole Zita comic book. “This plan of impressing this girl totally worked because she married me and here I am with my five daughters and Anna is still putting up with my crazy artistic ways,” he said. According to Hatke, Anna chose the name Zita after St. Zita, who was the patroness of the region where Anna’s father grew up in a village in Italy. From the very beginning of Hatke’s career, C.S. Lewis and J.R.R. Tolkien have been favorite storytelling influences. But while his style is similar to “The Chronicles of Narnia” by Lewis, Hatke tends to favor the storytelling philosophy of Tolkien, who was against making a story too message driven. One thing that’s become more apparent in Hatke’s work is the influence of his family. “I had a reason to look back in my stack of books, and it was shocking just how much of my interior life and psychology life comes out, especially in the Jack books,” he said. In his latest graphic novel “Mighty Jack,” released in 2016, the main character’s house is identical to Hatke’s and the similarities do not stop there. Anna and the girls play an important role as his first line of editorial support. The girls like to check on their dad at work and sometimes he will test a joke on them. If it goes over their heads he knows to try again. One night when he was working on the third Zita book, Hakte felt he finally had a good story and told it to the girls during homemade pizza night. “I was telling the story and I got three-quarters of the way through and I was like this is getting late, why don’t we eat our dinner and finish up and they were like ‘No! No! Finish the story now!’ And I knew this was working,” Hatke said with a smile. He relies a lot on Anna’s advice. They discuss developing projects when they are driving around town. His book “Little Robot” started out as a series of comic strips that he made during a time when he definitely had more important things to do. It turned into a book and won the 2016 Eisner Award for best publication for early readers. “It has ended up being one of the books that is so important to me and it came because I was just ‘goofing-off,'” he said. The rising popularity of his books and the possible movie has reminded Hatke about the responsibility writers have to their young audience. He equates it to the responsibility felt by a favorite arachnid-bitten superhero of his.